Travel Tags ACED the Test! INVER GROVE HEIGHTS, MN - Ten distinguished professionals of Travel Tags have recently received ACE-M Accreditation from the International Card Manufacturers Association. After a rigorous day of training and a four hour exam, these employees have been acknowledged for their expert-level understanding of the card manufacturing process, including PVC/Plastics, Inks, Adhesives, Printing, Collation, Lamination, Die-cutting and Standards/Testing. This esteemed accreditation is also testimony to their strong dedication, work ethic and drive for continuous improvement. INVER GROVE HEIGHTS, MN – Travel Tags, Inc. is the proud recipient of the 2012 “Partner of the Year” award presented by First Data Corporation, a global leader in electronic commerce and payment processing. As a reflection of strong and positive customer relations with one of its top partners, this award commends the efforts of everyone at Travel Tags. “We are honored to have this award displayed in our office, reminding us of our longtime relationship with First Data. It not only reflects the work we do as individuals but serves as positive reinforcement for the entire Travel Tags family to continue providing excellent service,” said Laura Johnson, Sales Representative at Travel Tags, Inc. The “Partner of the Year” award illuminates Travel Tags’ willingness to commit to its partners, ability to impact their success, and the trusted relationship that is fostered year after year. Travel Tags strives to deliver unique and innovative solutions in the card manufacturing and secure packaging space while focusing on quality, service and on-time delivery. INVER GROVE HEIGHTS, MN - Travel Tags recently claimed two 2013 American Inhouse Design Awards for web design and holiday mailing. For nearly five decades, Graphic Design USA has sponsored design competitions that allow inhouse designers and marketers to showcase their work. Selected out of 4,400 entries, Travel Tags was honored for its creativity and excellence. 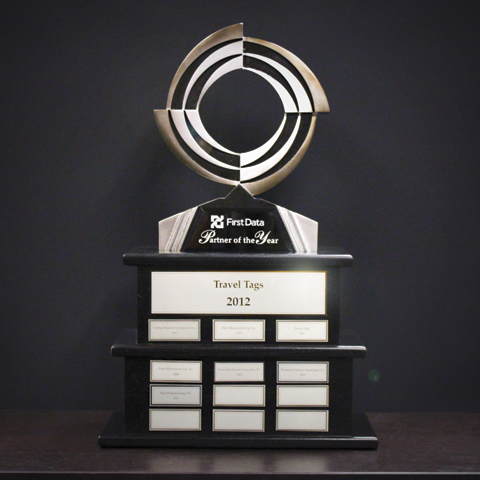 The Travel Tags website received an award highlighting its effective design and visual appearance. Reconstructed and debuted in January 2013, the inhouse designers at Travel Tags envisioned a site that would mirror the quality and excellence of the company’s products and services. The elevated design is adorned with bright colors and bold visuals that capture the user’s attention. The second award is for Travel Tags’ 2012 holiday mailing piece, which helped build brand awareness during the holiday season.